Baingan ke pakore is a delicious, yummy pokoras generally prepared in Indian Punjabi households. These are a big change from usual onion and potato pakoras. 1. Wash brinjal and cut into semicircles pcs. Even circle pcs can be cut as well. Soak these in water to avoid oxidation. 2. For the batter mix both flours, all spices and make a smooth batter with water. Add sesame seeds and add a pinch of cooking soda. 3. Keep oil for heating. Drain the water from the brinjals pcs and sprinkle little salt and red chili powder on these pcs. 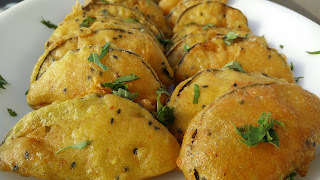 Dip brinjal pcs in the prepared batter and deep fry on medium flame. 4. Serve hot with sauce or chutney and garnish with chopped green leaves.